Francis Bremer in "John Winthrop" defines a sermon gadder as-"one who traveled to other parishes to listen to additional preaching". Further he notes that "stranger churches", foreign protestant churches, were visited by the early evangelicals, 16th C., to learn latest reforms from Europe. Sam, of course, no evangelical, but he was a gadder. ...A central London Protestant community ... stemming from the emigration of French and Flemish Protestants to England in the sixteenth century. The main place of worship was in Threadneedle Street in the City of London. Founded in 1550, when Edward VI granted Protestant refugees freedom of worship by royal charter, what had previously been St Anthony's Hospital Chapel, became known as the French Church. The medieval building which dated back to the thirteenth century was destroyed in the Great Fire of London, but by 1669 the hardworking Huguenots had erected a new church, one of the first to be rebuilt after the fire. 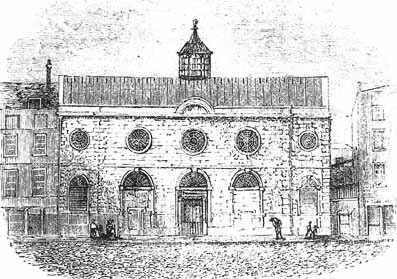 It was demolished in 1841 to make way for the Royal Exchange. Edward VI's charter required the names of all pasteurs to be submitted to the sovereign for approbation and the tradition continues with the French Pasteur being the only foreign minister to be appointed by Her Majesty the Queen. After the revocation of the Edict of Nantes by Louis XIV in 1685 there was a large immigration of French Protestants to England. In 1700 something in the region of 5 per cent of London's population were Huguenots, who brought with them a wealth of trade secrets and in some cases financial capital also. The Huguenots contributed overwhelmingly to the development of the textile, gun-making, silver, watch and clock-making industries, to the creation of the banking and insurance business as well as to the sciences and the arts. there also be another French Church at St. Martins Lane on the way to the Tems. (This may be the church building as rebuilt after the Great Fire). The French Protestant Church was founded by Edward VI. in the church of St. Anthony's Hospital in Threadneedle Street. This was destroyed in the Great Fire, and rebuilt, but demolished for the approaches of the new Royal Exchange. The church was then removed to St. Martin's-le-Grand, but this was also removed in 1888 to make room for the new Post Office buildings.